Free extra controller and $50 savings with the Xbox One S 1TB Fortnite console bundle. Xbox One S lets you play hundreds of games, stream in 4K, and watch UHD Blu-ray movies. The premise of Fortnite is simple: up to 100 players land on an island. Each player collects weapons and gear while taking out challengers. The last person standing wins. 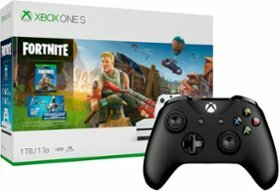 This Xbox One S Fortnite bundle includes a download of Fortnite Battle Royale, plus extras such as the Eon cosmetic set download, 2,000 V-bucks, and one-month trials for both Xbox Live Gold and Xbox Game Pass. With an extra controller, you can join forces with friends or take on challengers. Choose your additional wireless controller in black or white for free when you buy the Xbox One S Fortnite console bundle below.